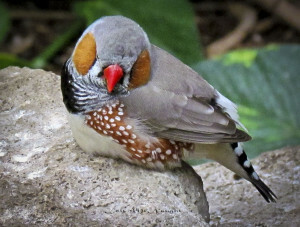 The Zebra Finch is one of the heartiest finches, making it a good choice for beginners and experts alike. He possesses a cheerful happy disposition, yet Zebra Finches are fairly shy around people, they do not like to be held or pet like some other bird species. There are always exceptions to this rule, however, if you are looking for a pet bird you can hold you should probably not buy a Zebra Finch. Because they are social creatures, it is recommended that they be kept in pairs. One of the Hallmarks of this breed is his chirping song. It should be noted that males are typically superior in singing ability to females. Some females will never sing at all. If treated with hormones after hatching females can be altered to sing much as males. The Zebra Finch is a highly active bird, and it is recommended he be allowed plenty of space within his cage or indoor aviary to fly freely. This space should never fall below 18-20 inches square. The Zebra Finch is colorful and quite lovely to behold. There are several different color variations for the Zebra Finch including white, white-gray, milk chocolate, silver, and fawn. All of these color varieties can occur with pied markings as well. Males and females can be easily distinguished by the color of their beaks. Females exhibit orange beaks while the male’s beak is red. Males also show black chest stripes, chestnut flanks and ear patches and bright orange cheek spots, females usually lack these markings. In addition the female is usually significantly duller than the male. Some color mutations may produce males and females which exhibit the same color patterns, but one can always rely on the differences in beak coloring to make distinctions. 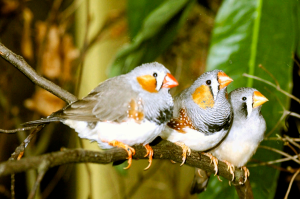 One of the most beautiful Zebra Finches is the crested Zebra Finch, which comes in two color varieties. 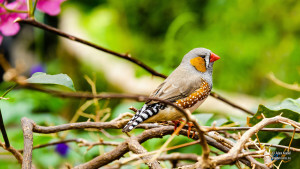 The Zebra Finch is very small averaging only 9cm at maturity. Because of their high energy it is particularly important to maintain a healthy diet consisting of fresh seed mixes (with a variety of different seeds), millet, dried or fresh greens, and other low fat fresh foods. Food supplements such as petamine and nestling foods are a must when molting, breeding or under any other stress. Many also recommend a regular dietary supplement of minerals and vitamins as well. Cuttlebones or mineral blocks are also important to providing Zebra Finches with additional calcium, which is very important to breeding hens. 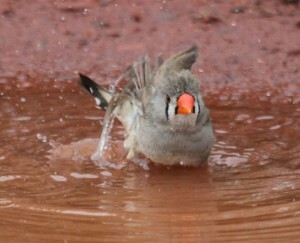 The Zebra Finch originates in Australia. 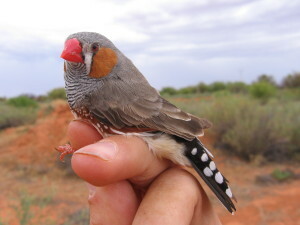 They wild Zebra Finch is commonly seen in Australia’s grasslands. Today Australia prohibits the exportation of most animals, hence most of the Zebra Finches you see around the world were captive bred outside of their native country. 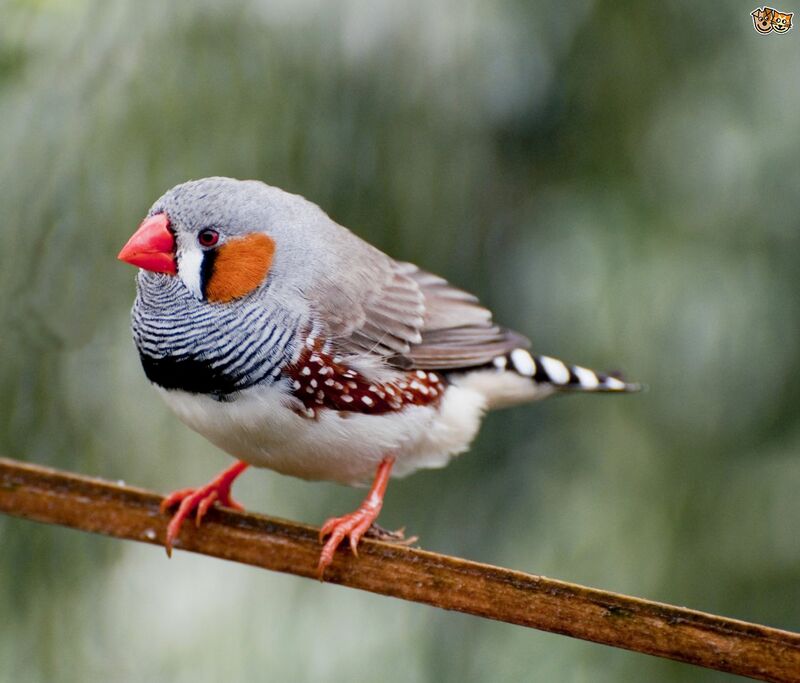 The wild Zebra Finch is a social bird typically seen traveling in large flocks. The diet of the wild finches consists of fresh foods and bugs. Zebra Finches are generally healthy birds. Some things to watch for include; illness (one sign of an ill bird is lethargy or puffiness, many birds will display no symptoms when ill), keeping nails short (this usually will happen naturally), leg bands that fit properly, strings hanging from toys (strings can be very dangerous and should never be used without supervision). 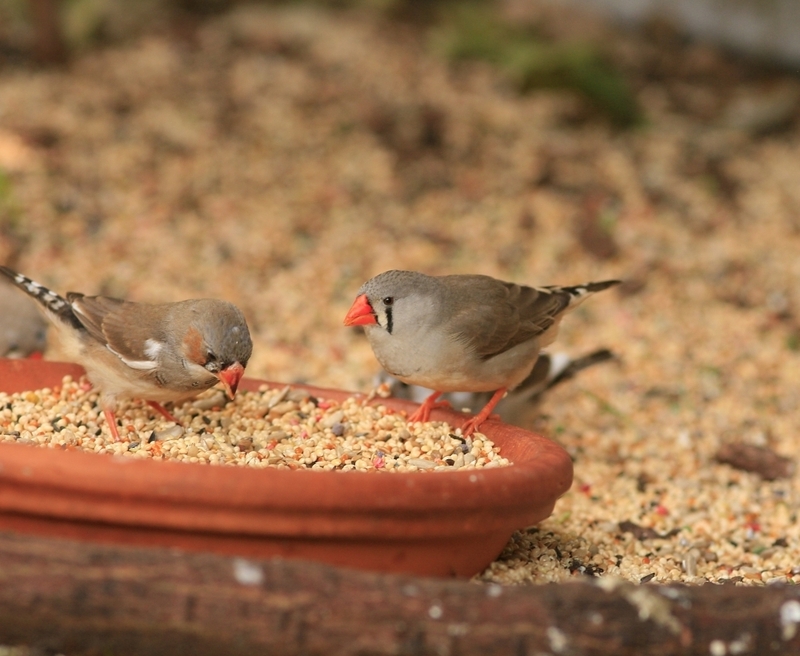 A balanced diet and clean living conditions will contribute to keeping your Zebra finch healthy and happy for many years. 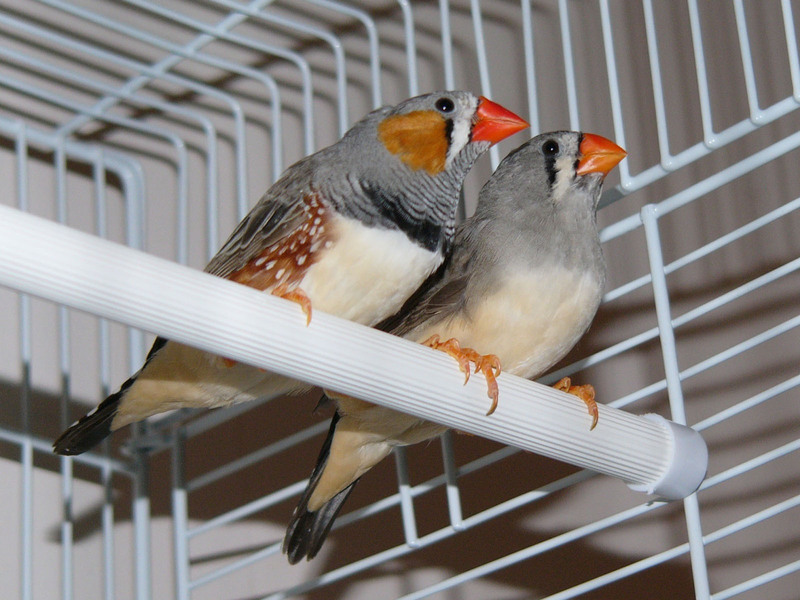 Zebra Finches are one of the easiest birds to breed. 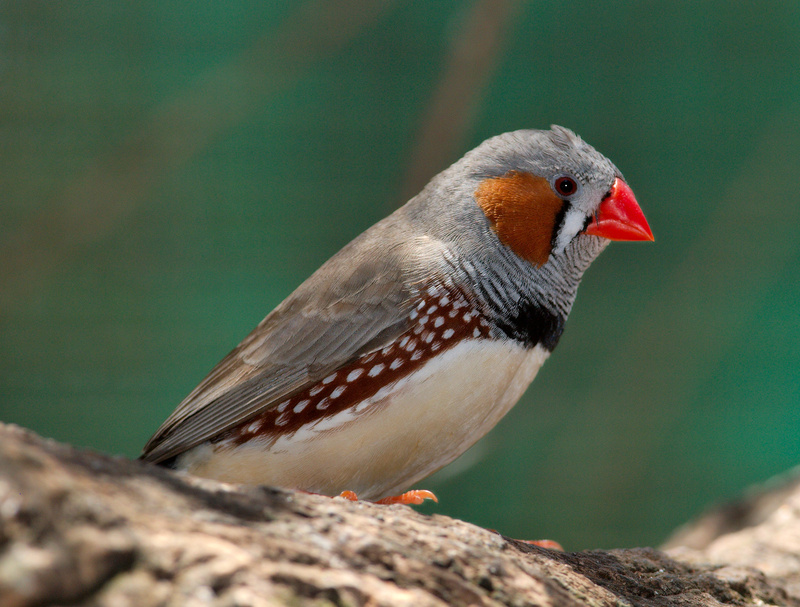 Being a rapidly maturing creature the Zebra Finch is reading for breeding as early as 11 – 12 weeks. Most will recommend waiting until at least six to nine months of age before beginning a breeding program. 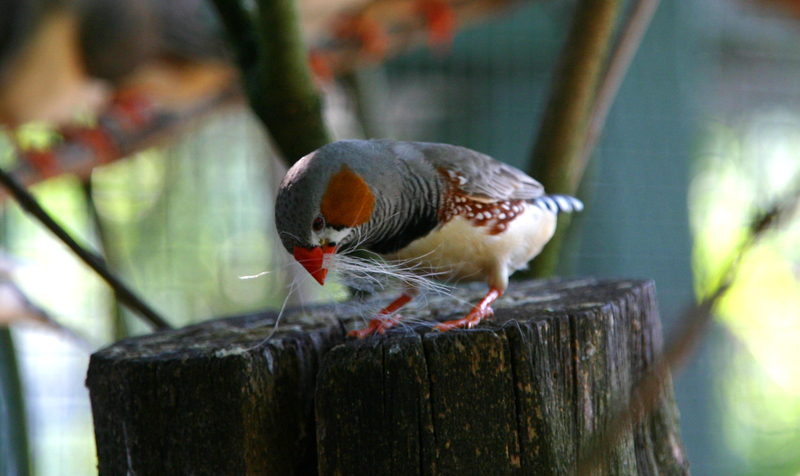 Most Zebra Finches will breed in nests; one can use a wicker nest or a breeding box with a small hole in the opening. The hen will typically lay three to eight eggs with an incubation period of about two weeks. Chicks can safely be removed from the nest at five to six weeks of age.